Treadmills with an incline feature have a larger motor for the running belt and a smaller motor that raises and lowers the deck. Some treadmill technicians and designers believe incline motors should be replaced when they fail to function properly. A new motor offers reliability and replacement is one consideration. Another approach is to bench test the incline motor and recondition it by servicing the internal components. 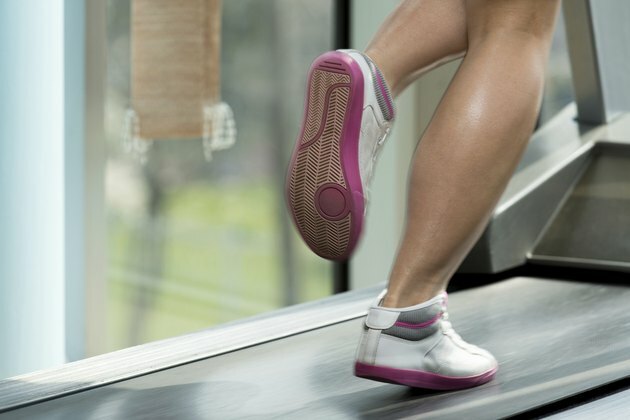 As long as other treadmill features are working properly, a simple troubleshooting procedure will determine whether a push- or pull-type incline motor can be fixed or if replacement is needed. The procedure begins with disconnecting the power cord to the treadmill and removing the running belt and deck. Locate the incline motor that’s positioned near the front of the running deck area. Disconnect the black and white wire leads on the motor from the terminal posts. You can find the posts by following each of the wires to a push-type connector. Pull the connectors from their posts and position them for a voltage test. Set a voltage meter on the lowest resistance and insert the red tip into the end of the white wire connector. Insert the black tip into the connector on the end of the black wire. Observe the voltage indicator and select the next level of resistance on the meter. Continue to select another level until you get a reading on the voltage indicator. If you don’t get a reading the motor must be replaced. If you get a reading, the problem may be with the incline assembly. In either case, remove the bolts on the incline motor mount with an Allen wrench or hex wrench and remove the motor. Lift up on the front of the running deck frame and note any resistance in the incline function. Lubricate the hinge points of the incline assembly with all-purpose grease and recheck for any resistance when lifting and lowering the running belt frame. If the voltage test proved positive and the incline works easily with lubrication you can reinstall the motor, connect the black and white wire leads to their posts and reassemble the treadmill. Bench test the incline motor by removing the screws or small bolts that hold the electrical motor to the housing. Loosen these with a screwdriver or Allen wrench. Pull the electric motor out of the housing and inspect the gear on the end of the motor shaft. If the gear is damaged the motor must be replaced. Clean the inside of the housing with compressed air. Rotate the threaded spindle on the opposite end of the housing to ensure it turns freely. If necessary, lubricate the movable components with all-purpose grease and rotate the spindle again. If it’s working easily you can reattach the motor to the housing and reinstall the motor into the treadmill. Consult the owner's manual or a treadmill technician for additional suggestions. Refer to replacement parts by model number, style and treadmill manufacturer. A canister of compressed air can be used to clean components. Do not conduct a voltage test with 110 AC current.